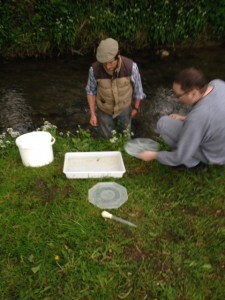 In conjunction with the Environment Agency, CATCH is now monitoring the Cale with regular kick samples, which help to keep track of the population of insects and other invertebrates in the river. Although the large, obvious wildlife species such as birds, fish otters and water voles, are much more visible signs of progress, the invertebrate population – such as caddis flies, riverflies, gammarus and mayflies – is a particularly useful guide to the health of the river, because it reacts much more quickly to any changes, good or bad, which affect water quality. A sudden and unexpected decline in invertebrates is a very effective alarm system for something nasty having happened which needs to be investigated further upstream. This week’s sample, though, provided much in the way of good news rather than bad. The sample site further downstream, by the A303 bridge, was particularly rich in species which had been almost absent when the site was sampled last autumn, which shows that the water quality has been improving throughout the winter and early spring. The sampling also managed to snare one bullhead fish, a photograph of which now adorns our page detailing his lifestyle and habits. Both he, and all of the insects involved, were returned safely to the river without mishap. Kick sampling will continue on a fairly regular basis throughout the warmer months. If anyone would be interested to see one taking place, please get in touch via our email, info@rivercale.org, or CATCH up with us at one of our various events! It’s worth noting that CATCH has three protected sites now logged with the Environment agency. We will conduct a test every month and report back findings on a spread sheet to the EA. It should be a great indicator to CATCHs success with habitat improvement on the Cale.